Are you ready for Fashion Friday?! With Summer here, you can never have too many sandals and flip flops! 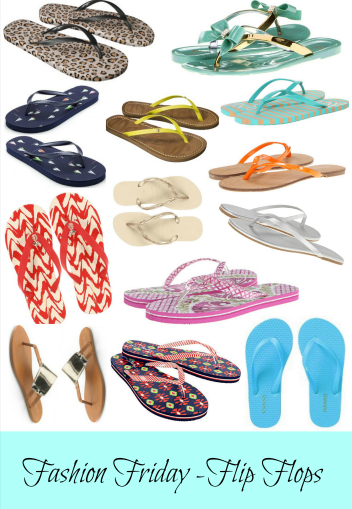 Here is a round up of some great, stylish Flip flops that you can snag right now! Enjoy! Animal Print Flip Flops $6.99. Find 5 other price including Floral, Stripe, and Polka Dot. This item qualifies for free shipping when you spend $50 on qualifying items. Green and Gold Nomad Pixie Flip Flops $19.99 $30. This style features a bow with a rhinestone center. FREE Shipping included. Three other colors including Zebra, Coral and Black. Navy Blue Sail Boat Flip Flops $1.99 $5. Perfect for the Nautical summer! Three other prints including chevron and pink stripe. Use the promo code STYLE20 for 20% off Women’s Apparel, CELEBRATE for 15% off and FREE Shipping when you spend $75, or SAVEU15 for 15% off site-wide. Yellow and Tan Mad Love Lainne Flip Flops $12.99. This item qualifies for free shipping when you spend $50 on qualifying items. FREE Shipping included. Capri Teal and Tan Stripe Flip Flops $15.99 $20. Find also in Coral Stripe and Blue Stripe. FREE shipping on everything at 6pm.com. Tommy Bahama Red Pineapple Flip Flops $16.99 $28. Beautiful and classy, these flip flops comes with a rhinestone pineapple. Also in black. FREE shipping included. Gold Braided Havaianas Flip Flops $16.99 $30. You can also find more on these on 6pm or on Amazon for as low as $6.99. A huge discount for this designer, Brazilian brand. Price includes FREE shipping. Silver Esprit Flip Flops $12 $29.99. FREE Shipping included. Pink Julep Tulip Vera Bradley Flip Flops $19.99 $24. FREE Shipping included. Metallic Cuff Thong Flip Flops $8 $20. Use the promo code STYLE20 for 20% off Women’s Apparel, CELEBRATE for 15% off and FREE Shipping when you spend $75, or SAVEU15 for 15% off site-wide. Sun Valley Red and Blue Vera Bradley Flip Flops $16.80 $24. Old Navy Flip Flops $3 $3.94. These classic and well-loved flip flops start at $2.50 for Women. Target has similar flip flops, 2 for $5. This week you can also grab 2 for $5 at Walgreens or $2.99 each. In late June, Old Navy will have $1 Flip Flop Saturday.